As I chronicled a few years back, my mom has a great system for Thanksgiving — every year, the day after the feast, she sits down with her legal pads and writes her post-mortem: What went wrong, what went right, what we need more of and less of next year, whether the dogs behaved, you know, the important things. 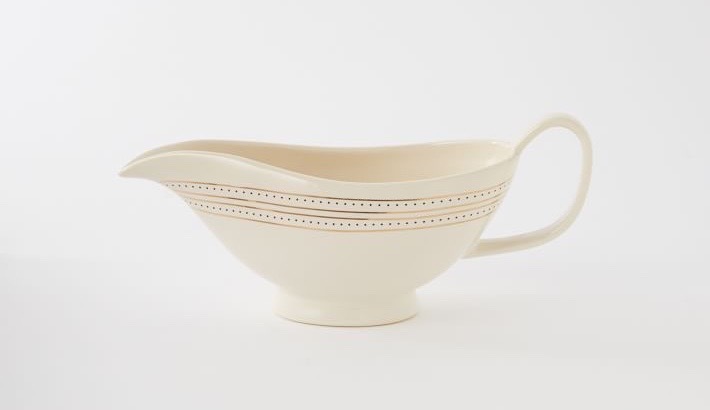 Every year, she asks me for my input and every year I say the same thing: “We need a gravy boat.” This is the kind of note that is not helpful if you’re reading it the night before the feast, which is often the situation I find myself in. Not this year, though. I picked up this Noritake number ($45, shown in yellow but mulitple colors), but not before doing a little comparison shopping. Thought you guys might like to see where my research sent me in case you are in the market for one yourself. Madame Secretary’s post-mortem notes. “Papa forgot bread!” Uh oh. When I first saw the picture of the yellow Noritake, I thought it was going to be part of the Ikea Sinneglig you talked about last week! Reminds me of something in a Montessori school. 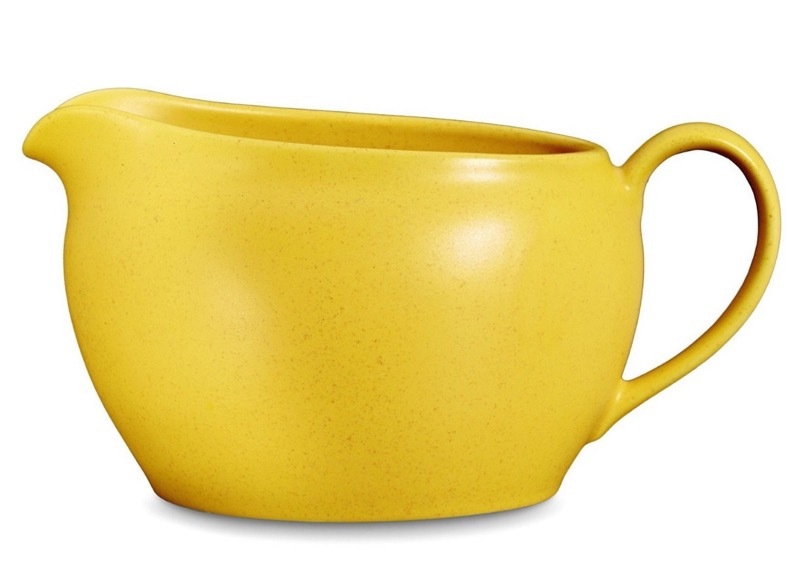 This will be my first time hosting Thanksgiving, so I ran down to Goodwill to pick up a gravy boat. 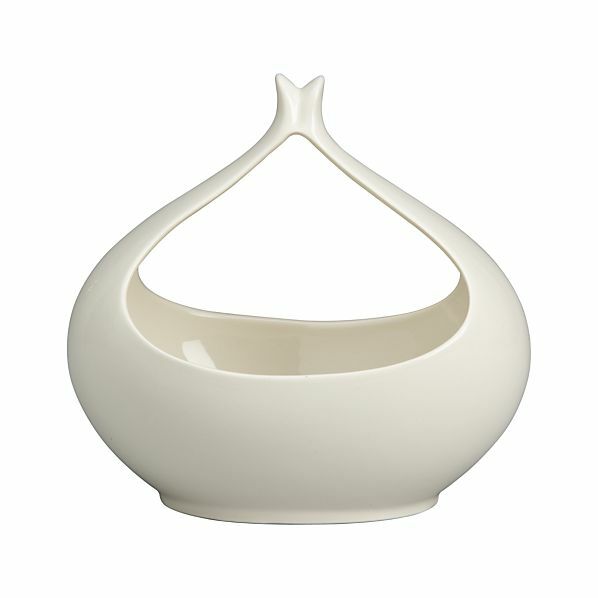 If it was something I used more often I’d definitely pick up one of the ones you posted- the Eva Zeisel one in particular is stunning. The pouring bowl is only for the wealthy and right handed. 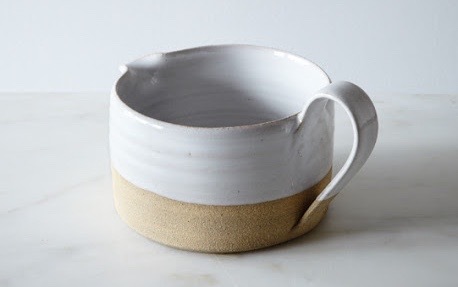 I have several pieces of their stoneware. It’s definitely more affordable than the cast iron pieces. One thing I really like about it is that it cleans up very easily. A soak gets baked on stuff off. Those are so much nicer than my Pyrex glass measuring cup…. Love other people’s notes. Right above the first little line up from the bottom – does it say “no cranberry hands in living room”? If so, what does it mean? Who had their cranberry hands in the living room and what did they do to get all cranberry hands banned? Dying to know! Oh God…cranberry hands on the couch? I’m imagining the potential horror. And my gravy boat was a wedding gift from my husband’s Baltimore family, so it has crabs on it. Not very Thanksgivingy, but I love it. Haha – I was thinking the exact same thing! No cranberry hands in the living room – was this something that went right or wrong? 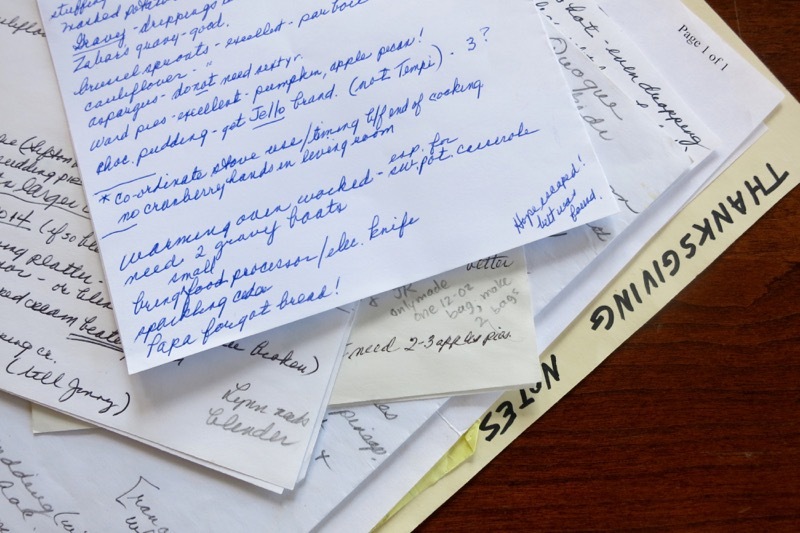 I love that your mom takes notes – I do the same with trips. 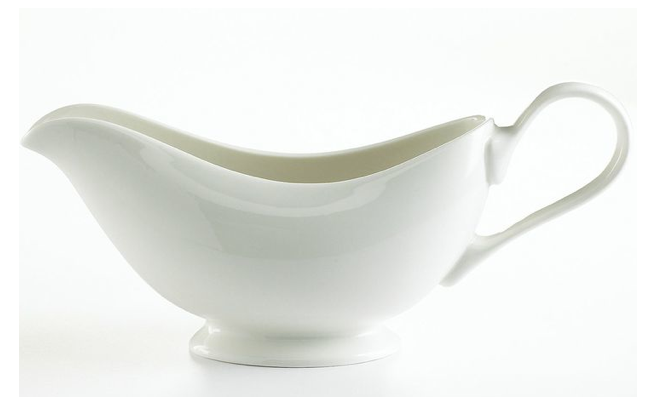 Great choice on the gravy boat. Our family tradition is to close up the cottage with (Canadian, thus in “April”, according to Aaron Sorkin!) Thanksgiving. This year no one brought one and we ended up using the ancient brown betty teapot. Worked perfectly and kept the gravy warm. Love these pieces! Amazing picks! Glad to know I’m not alone! Notes from my very first Thanksgiving three years ago say: we need a gravy boat. Lucky for me, I picked one up at our local antique store for .25 the very next day. “Hope escaped; but was found.” Probably a dog. But at my house, there is always a moment in trying to get it all on the table at the same time, and still warm, when hope does escape; and then, of course, is found. Last year I started doing the post-Thanksgiving notes after reading about them in your column, and they are super-helpful! I knew last year’s turkey didn’t provide the amount of leftovers I wanted, but of course I did not remember what size I got…consulted the notes today, where I had written that this year I needed a 16-17 pound turkey next time. Done! 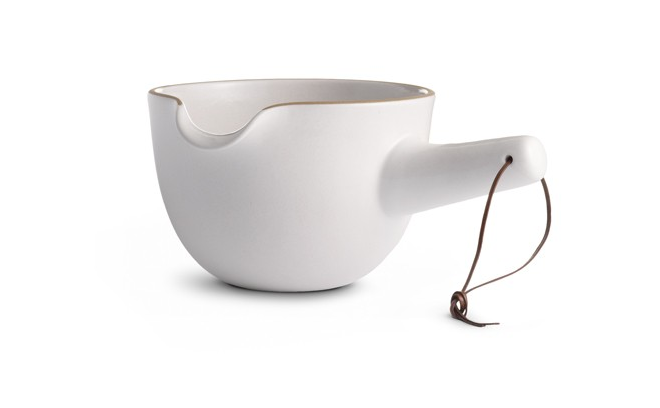 These gravy boats are awesome. 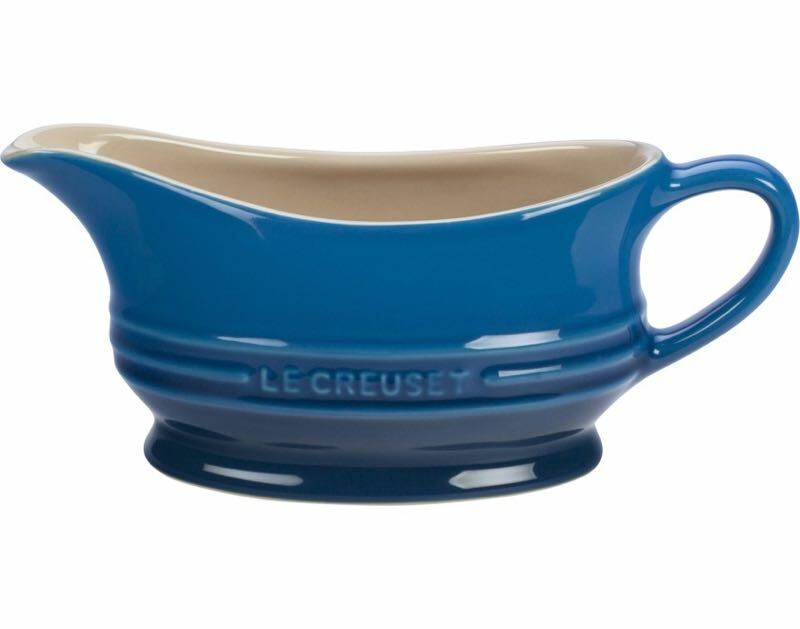 I have also purchased a really good quality of stoneware gravy boat online and now I am going to surprise my husband on Thanksgiving with this dish.